Carnival in Venezuela (2 days of festivals, 40 days before Easter) is a time when youth in many rural towns have water fights. Anybody and everybody that is out in the streets during the week of Carnival is subject to being soaked. Venezuela celebrates carnival with dance, music, balloons, family festivities, lavish costumes and parades. Coastal town and provinces celebrate Carnival much more fervently these days than any place in the country. Merging much of the Caribbean flair for music, dance and ethnic backgrounds, the city of El Callao enjoys dressing in costumes of royal courts: kings, queens, couriers, jesters as well as modern movie and cartoon characters. Venezuela regard Carnival in the same way they regard Christmas and Semana Santa (Holy Week; the week before Easter Sunday) when they take the opportunity to visit their families and enjoy this festive time with them. In Venezuela, many of the traditions are very similar to the ones in Spain, with an over-emphasis in traditions that supposedly bring good luck in the upcoming year. Those who want to find love in the New Year are supposed to wear red underwear on New Year's Eve; those who want money must have a bill of high value when toasting, those who want to travel must go outside while carrying luggage, and so on. Yellow underwear is worn to bring happiness in the New Year. Radio specials give a countdown and announce the New Year and in Caracas, the bells of the Cathedral of Caracas ring twelve times. During these special programs it is a tradition to broadcast songs about the sadness of the end of the year. Popular songs include "Viejo año" ("Old year"), by Gaita group Maracaibo 15, and "Cinco pa' las 12" ("Five minutes before twelve"), which was versioned by several popular singers including Nestor Zavarce, Nancy Ramos and José Luis Rodríguez El Puma. The unofficial hymn for the first minutes of the New Year is "Año Nuevo, Vida Nueva" ("New Year, New Life"), by the band Billo's Caracas Boys. Feria Del Sol (English: Fair of The Sun) is an international cultural festival held in the city of Mérida every February of the year. 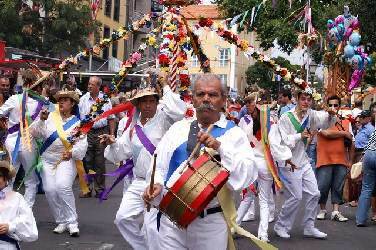 The Feria festival is held alongside the carnival feast. The festival includes bull competitions, cultural expositions, commercial and zootechnic expositions, concerts, parades, sports, and a voting competition for La Reina Del Sol (English: The Queen of The Sun). The city of Mérida or City of the Knight had celebrated its historic past in Venezuela, but it did not have fairs similar to the cities of San Cristóbal, Barquisimeto, Maracaibo, or Táriba. Therefore, a group of amateurs got the idea to build a Plaza de Toros (Plaza of Bulls), so that Mérida had a taurine calendar and a fair counted among the most important of the country. The fair was set for 9 and 10 December, as the feast of Immaculate Conception coincided with the beginning of the month. For the bullfighting, César Faraco, Manuel Benítez "El Cordobés", Francisco Rivera "Paquirri", Julio Aparicio, Curro Girón, Paco Camino and the mounted bullfighter, Juan Cañedo, who is of Mexican origin, fought the bulls of Félix Rodríguez, "Achury Vejo" and "Ambaló", who all originated in the country of Colombia. Since then, the fair has developed into one of the most important fairs of Venezuela, as well as the taurine world. The Bonfires of Saint John is a popular festival celebrated around Saint John's day's eve (23 June) throughout many cities and towns in Venezuela. For this festival, people gather together and create large bonfires. From June 23 you can enjoy a night of drums on which commemorates the death of the saint, the night belongs to the wake of San Juan. This quaint night runs to the sound of drums, dancing and alcohol, activities preceding the next day's festivities in honor of the saint (The Birth of St. John the Baptist).
. 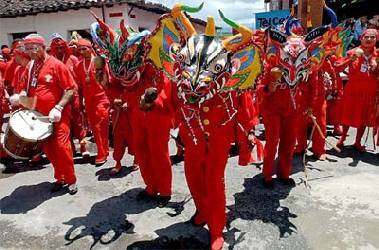 The Dancing Devils of Yare is the name of a pagan-Christian celebration in San Francisco de Yare, Miranda state, Venezuela, at the Corpus Christi day. Its origins are traced back to the 18th century. Every Corpus Christi (nine Thursdays after Holy Thursday), a ritual dance is performed by the so called "Dancing Devils", who wear colorful garments (commonly all red), layers of stripped fabric, masks of grotesque appearance and also accessories like crosses, scapulars, rosaries and other sorts of amulets. In this folkloric festivity devotion is given to the patron saint Saint Francis of Paola, to the Blessed Sacrament and to Jesus Christ. The celebration starts Wednesday with a wake where fulías (a native music style) are played, décimas (native form of poetry) are recited and rosaries and other prayers are prayed until dawn. The next day the devoted disguised as devils perform dances around the principal square of the town. They also parade through the streets, dressed in their red costumes and their masks.